Sweet Freedom – Review and Giveaway! This post is linked to Simply Sugar and Gluten Free’s Slightly Indulgent Tuesday. 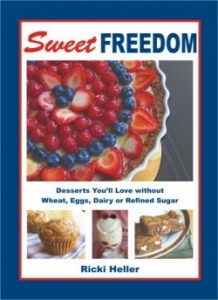 Over the last few weeks, I have been cooking my way through Sweet Freedom: Desserts You’ll Love without Wheat, Eggs, Dairy, or Refined Sugar by Ricki Heller. I have created some wonderful little gems out of this cookbook and have fooled quite a few people with these decadent treats recently. Ricki Heller has managed to solve the problem of bland tasting Vegan treats. She has created a cookbook that turns desserts without Wheat, Eggs, Dairy, or Refined Sugar into scrumptious sweets that you would be proud to serve to even the most pickiest of palates. Better yet, is the nutritional punch that most of them serve up! You may already know Ricki from her blog, Diet, Desserts, and Dogs. If you are like me, you can easily get pulled into her easy writing style filled with humor, comfort, and, of course, amazing nutritional information. Her site is full of wonderful insight into the world of whole foods, anti-candida living, and funny anecdotes about her dogs, Elsie and Chaser. She has written three books now. Anti-Candida Feast is perfect for anyone with dietary restrictions, Type II Diabetics who must eat low glycemic foods, or anyone who wants less refined sugar in their lives. Her latest to be released, Desserts Without Compromise, is full of delicious, tempting, sweet and satisfying desserts–all made without gluten, eggs, dairy or sugar, and all low glycemic. And then the one which I have been playing with, as of late: Sweet Freedom! To many of us, the term “healthy dessert” sounds like an oxymoron. After all, conventional desserts contain many not-so-healthy ingredients: butter is high in saturated fat; eggs are loaded with cholesterol; milk contains allergy-inducing lactose or casein; refined sugars and flours have been stripped of almost all their nutrients. Yet we have to wonder, is it possible to enjoy authentic desserts without consuming any of these offending foods? Delicious, appealing, and healthy treats seem to be the last unconquered frontier when it comes to today’s health revolution. Finally, Sweet Freedom proves that you can have your cake, and great health too! With over 100 original, innovative sweet treats using whole, natural, unprocessed ingredients, Sweet Freedom shows you how to create delicious desserts free of wheat, eggs, dairy or refined sugars. All the recipes are suitable for people with food sensitivities or those on restricted diets for health or religious reasons. With recipes that taste every bit as good as—in some cases, better than—conventional desserts, you’ll be happy to learn that the terms “healthy” and “delicious dessert” are no longer mutually exclusive! And while every word of the above description is true, the proof really lies in the pudding. Or in this case, the Banana Oat Bars, Walnut Cinnamon Rounds, and Mini Sweet Potato Chocolate Chip Muffins that I have whipped up so far. The above Banana Oat Bars were perfect! I made them one day (using certified Gluten-Free oats to make them safe for us) while my family was out at the lake. After a day of boating and sun, they were famished when they walked in the door. I probably do not need to tell you how quickly the plate of these disappeared with my six and three year old sons, my eleven year old nephew, and my husband diving into them. I am just glad I got a picture of them before they were gone. The real magic of these, however, is the review my nephew gave. He is, by far, one of the pickiest children I know. Anytime he even thinks he is eating something that is gluten free (since he is definitely not), he immediately claims disgust. But, I will tell you here, that he out-ate both my boys and my husband with these. I cannot blame him – these were chewy with just the right hint of banana and chocolate. Ricki suggests topping them with your favorite frosting as well, but I think that they do not even need it! Next up were these Walnut Cinnamon Cookies. They remind me exactly of the ice-box cookies that my Grandma, my Mom, and my Aunt have made ever since I was born. Just like the cookies I remember of my youth, these are completely addictive and irresistible. I did have a bit of a mishap with these, however. After the first cookie sheet came out of the oven looking absolutely perfect, I threw the next sheet in and went on about my morning getting the boys ready for school. A bit later, my husband walks into the kitchen, “What is burning?” Yikes! I never set the timer for the second tray. Such is life on a busy school morning. So the eight to ten minute bake time turned into thirty five! Not pretty! Then, as I was prepping the initial successful tray for my little photo session, I got off a few rounds of shots, then realized time had snuck away and I had to drop the kids off at school. Leaving everything where it was, I headed out the door…..only to come home to an empty canvas! My Wheaten Terrier (a breed so ironically named since he, as is the case with most Wheaten’s, cannot tolerate any wheat and is on a totally gluten-free diet) had devoured my prop! Lucky for him, the treats were gluten-free and safe. I can not really blame him though. These cookies smelled DIVINE! Luckily I had gotten the above shot that I was able to use. Since then, I have made these two more times. Both without incidence. Both gone before I got as many as I would have liked. And finally, I had to test out the Mini Sweet Potato Chocolate Chip Muffins. I loved these! They had the perfect amount of sweetness. 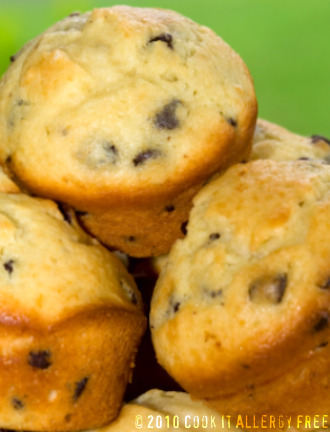 The mini chocolate chips made for a great flavor combination and my kids thought these were such a special breakfast treat. This recipe, as written, is not gluten free, but I successfully traded out the 1 cup of Spelt flour for 1 cup of brown rice flour without any problems at all. These are a healthy way to start the day for sure – they are packed with sweet potatoes and flax meal. And for the dairy-free milk option I chose Hemp Milk, which added even more nutritional benefit. Needless to say, I have had fun with this cookbook. The recipes are nicely divided up into Breakfast Baking; Cookies, Bars, and Squares; Cakes, Cupcakes, Toppings, and Frostings; Cheesecakes, Pies, and Baked Puddings; and Raw and No Bake Treats. The recipes are coded to indicate which are corn free, gluten free (or a gluten free option), nut free (or a nut free option), and soy free (or a soy free option). Ricki also included a section on the ingredients she uses, including some awesome tips on how to convert conventional recipes to wheat free, dairy free and refined sugar free. In addition, she does something that I love in the recipe index. She lists recipes by main ingredients AND by category. Have a bunch of bananas on hand and need some ideas? No problem, just jump to the banana category and see all of the options. Walnuts? Yup, head to the “W’s” and see all of the possibilities there. Need something to make with those dates? Quick, check out the options there too! The bottom line: So many possibilities for delicious Vegan treats that satisfy the sweet tooth without ruining the diet! If you are Vegan, or have dietary restrictions, I strongly recommend you getting your hands on a copy of this book. You can purchase it right from Ricki’s site. And one lucky person is going to win a copy of it in the giveaway below. I am giving away one copy of this book. I will use a Random Number Generator on Tuesday, August 31st to determine a winner. You can be eligible by doing one (or all) of the following. Each one you do earns you an extra entry. 1. Leave a comment here. 2. Follow Diet, Desserts, and Dogs on Facebook. 3. Follow ME on Facebook. 4. Follow Ricki Heller on Twitter. 5. Follow ME on Twitter. 6. Share this giveaway through Facebook or Twitter. Just make sure to leave one comment here listing everything you did, so I can enter you the correct number of times. This sounds like a lovely cookboook! Great review. I love Ricki and her blog. I follow you both on twitter. I now also follow you both on Facebook. (OK, OK, I’ll follow you two anywhere!!! (Because I know if I do I will eat well, laugh well, and share well! ) And, I RT’d the giveway. I love Ricki’s blog and her recipes, it’s great to find someone who promotes healthy desserts in such an approachable way. I’ve been following her on twitter and facebook for awhile, but now I’m following you in both places too! I follow Ricki’s blog and would love her book. I keep thinking about that blueberry chia pudding! Now following you on Twitter! I want Sweet Freedom! Sounds perfect for Olivia! Your pics look amazing! I can’t eat dairy so this cookbook would be perfect for me. I am following Diets, Desserts, and Dogs on Facebook. I’m following IT allergy free on Facebook. Thank you for reviewing this cookbook. The recipes sound delicious! Looking forward to reading the new cookbook! Count me in! This looks fab! I follow Diet, dessert and Dogs on Facebook! @singerinkitchen is already following RH on Twitter. I follow Kim on Twitter! I am following Diet, Dessert, and Dogs on Facebook. I am following you (Cook It Allergy Free) on Facebook. The mini muffins look awesome. Sounds like a winner of a cookbook. Hi there – I did all of the options listed. 1-6. Thanks for entering me! The cookbook looks amazing. Can’t wait to try some of the recipes. This sounds like a wonderful book to cook from. Enjoyed the photos of the things you baked. 2. I Follow Diet, Desserts, and Dogs on Facebook. I just found you through a tweet of Adventures of a Gluten Free Mom. I am enjoying learning so much about being gluten free (ds is allergic to wheat, soy, corn, milk). Thanks! this sounds like a great book and I will share this info with a family member. I will check you and Ricki out on Facebook. I am a follower of all the twitters and facebook pages, so there’s 4 entries and I’m leaving a comment for 5! My son is allergic to eggs, so this would be great! I love her blog and would love to have a copy of this book!!!!! The pictures all look so mouthwateringly (is that a word?) delicious! We would love to get a copy of this cookbook. I had just found Ricki’s web site today and loved what I found. Everything looked so delish! This looks like a great cookbook! Sounds like an incredible cookbook!! I like DD&D on Facebook. I follow Diet, Dessert and Dogs on FB! 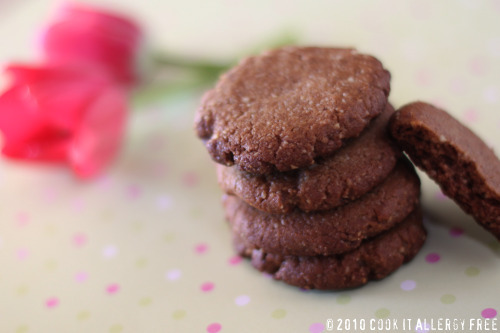 And I LOVE the idea of those walnut chocolate cookies! I follow Ricki on FB! This cookbook sounds super – I would love to be a winner! Thanks for the informative review! I would love to have a copy of Ricki’s book!!! 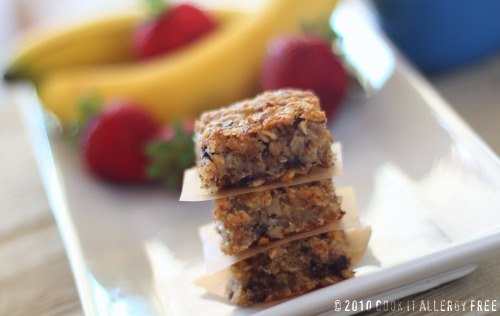 The banana oat bars look super yummy! I’ve been reading Ricki’s site and I’d love to check out the book. Thanks for the giveaway offer! tweeted for you too! thanks again! I am a fan of both Diet, Desserts, and Dogs and you on FaceBook. I would love to get my hands on a copy of Ricki’s book! I follow Ricki on Facebook! I follow RIcki on Twitter! I love healthy desserts. This book meets everything I want in desserts, healthy and tasty. I would love a copy of the book so I can bake my way through them. I’ve added your blog to my google reader. Not sure if I’m still in time for the giveaway. If I am, great! If not, oh well. Just want to let you know that these all sound wonderful. I just might have to pick up Ricki’s books. I have so many cookbooks and blog recipes to try… I just need the time. I loved the story about your dog. :0 Just too funny. And the oat bars look amazing. Need that recipe, for sure. I follow Diet, Desserts and Dogs on Facebook.